Born: 19th March 1884, Ipswich. 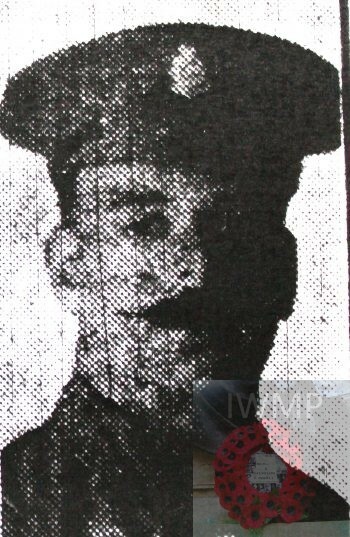 Died: 20th July 1917; age 33; KiA – whilst attending to the wounded – Palestine. Residence: 90, Croft Street, Ipswich. Employed: Great Eastern Railways, Loco Works, Ipswich – John had entered the company 14th June 1902 as a Boilermaker’s Assistant, before becoming a Pit Cleaner on the 21st February 1914. 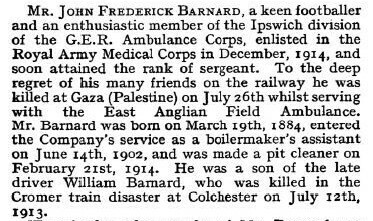 John was a member of the Great Eastern Railway Ambulance Corps, Ipswich Division. Enlistment Location: Ipswich; date: December 1914. Rank: Sergeant; Service Number: 473300. Regiment: Royal Army Medical Corps, 2nd/1st East Anglian Field Ambulance. Israel and Palestine (including Gaza). 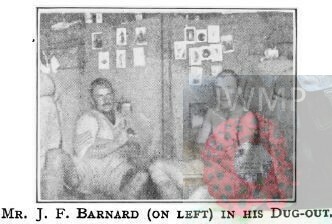 Relatives Notified & Address: Son of the late William H. Barnard; husband of Ethel E.R. Barnard, of 90, Croft Street, Ipswich. 1891 Station Street, March, Cambridgeshire. William H. Barnard, 34, a Railway Engine Driver, born Harleston, Norfolk. Ellen Barnard, 35, born Woodbridge, Suffolk. Fanny Maria Barnard, 11, born Ipswich. George William Barnard, 8, born Ipswich. Gertrude Ellen Barnard, 5, born March, Cambridgeshire. Ethel Primrose Barnard, 1, born March. 1901 12, Wherstead Road, Ipswich. John was 17 years old, an Iron Foundry Labourer. He was living with his parents & siblings. William, 44, a Railway Engine Driver. George, 18, a Railway Engine Cleaner. Gertrude, 15, a Shop Assistant – Drapers. Elizabeth Barnard, 9, born March. 1911 7, Cowell Street, Ipswich. 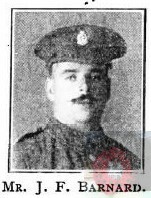 John was 27 years old, a General Labourer – G.E.R. He was married & Head of the Household. and Ethel’s daughter – Vera Mabel Lambeth, 1907, Ipswich. Soldiers’ Effects to Ethel E.R. 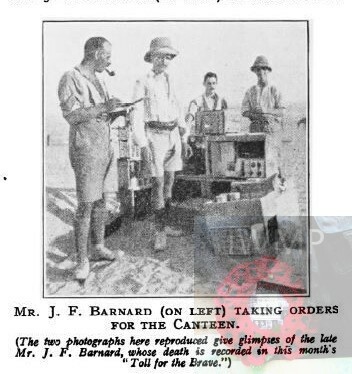 Barnard – widow. John is remembered on the Great Eastern Railway war memorial, Liverpool Street Station, London, and on the war memorial at St Mary at Stoke Church, Ipswich.